Each morning at Ashland Emergency Food Bank we greet shoppers, both new and some familiar. Some people come to the food bank due to an unexpected turn and some more regularly to stretch their food budget through the month. No one can begin to tackle life's problems if they and their children are not fed. Whatever the moment, the Food Bank is here to provide kindness, respite and food that will sustain physical and emotional health while other problems get sorted out. Your gift to Ashland Emergency Food Bank makes it possible for us to keep the lights on and the shelves filled. Please join us as we pursue the AEFB mission: to ensure that no one in our community goes to bed hungry. Although we run a lean ship, contributions are necessary to pay our bills. You can be sure that your gift will be carefully used and much appreciated. Ashland Emergency Food Bank is a 501(c)(3) charitable organization. Donations to us are tax deductible to the extent allowed by tax code. Cash or checks can be delivered to us during our open hours, or mailed to AEFB at: P.O. Box 3578, Ashland, OR 97520.
Credit card or Paypal donations can be made by clicking on the yellow "Donate" button above. Alternatively, your bank or financial institution can help you set up regular monthly donations through your checking account. We would be pleased to accept your monetary donations in person at the Food Bank during normal business hours, Monday – Friday and the first Saturday of each month, 9:30AM to 12:30PM. If you wish to donate foods that will specifically benefit those with food allergies, diabetes, and other types of conditions requiring dietary restrictions, view Gluten Free Products for a guide to product selection. For some customers with particular health challenges, organic products are especially appreciated. Food donations may be dropped off at the Food Bank during our regular business hours. We would enjoy thanking you in person! Otherwise, you may make donations at any time using the bin on the south side of our building at 560 Clover Lane. While our primary focus is food, our customers are also grateful for hygiene and household cleaning products. We'll gladly find a home for your succulent squash or surplus of greens. Bring your extra produce by anytime we are open. Our customers will be delighted to receive your home-grown fruits and vegetables. 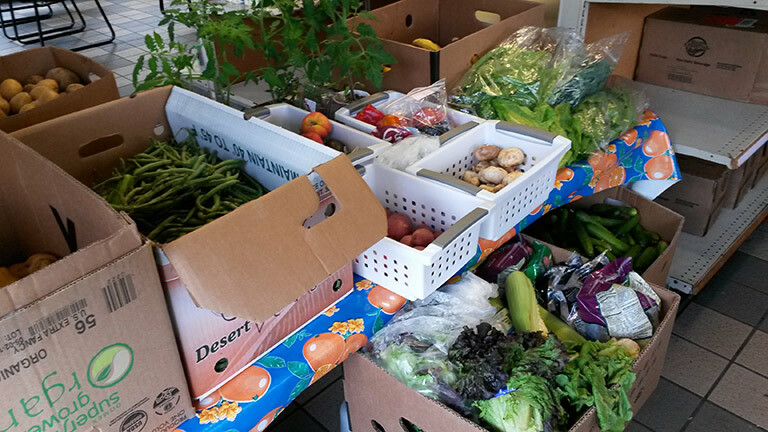 We have a great partnership with the Ashland Food Project - who provides us with 36% of our total donations. Every other month, more than 2,500 AFP donors send us food via those magic green bags. To learn more and to sign up, visit the Ashland Food Project website.